If you’re an elected member of a city or district council, then there are special rules for you under the Local Authorities (Members’ Interests) Act 1968. We strongly recommend our guide on the Local Authorities (Members’ Interests) Act 1968. The Local Authorities (Members’ Interest) Act 1968 (the Act) helps protect the integrity of local authority decision-making by ensuring that people are not affected by personal motives when they participate in local authority decision-making and cannot use their position to obtain preferential access to contracts. discuss or vote on matters before your authority in which you have a direct or indirect pecuniary interest, other than an interest in common with the public. We have the power to grant approvals and exemptions for the list above. The Act is a small subset of the law about conflicts of interest generally and applies to local authority members when they are making decisions. We have a specific role only in relation to financial conflicts of interest that are regulated by the Act. 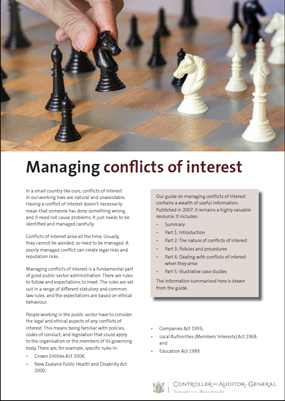 We have no formal decision-making role in relation to non-financial conflicts of interest. Only the courts can determine whether the law has been breached in any particular instance and what the consequence should be. However, we can inquire into matters of probity involving a member of an authority, which could include examining whether a member failed to declare a conflict of interest.